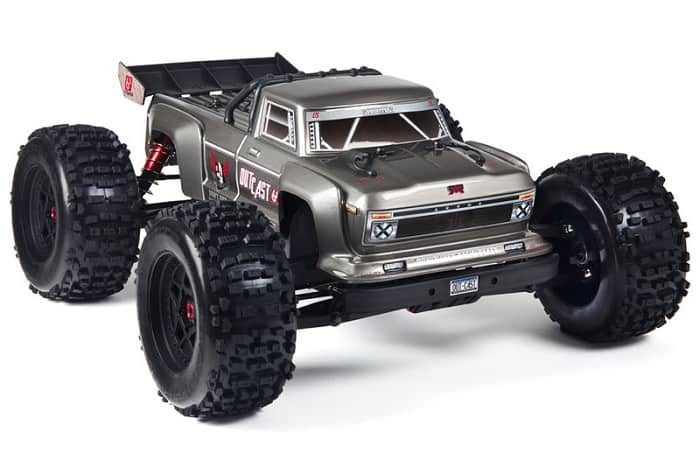 ARRMA OUTCAST 6S BLX 4WD 1/8 STUNT RC TRUCK RTR. 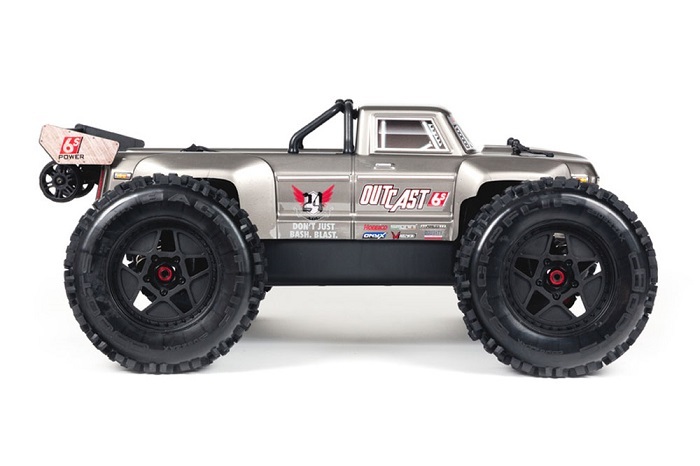 OUTCAST 6S goes where it wants, which is anywhere it can express its attitude. OUTCAST 6S is a rebel, designed to break conventions. 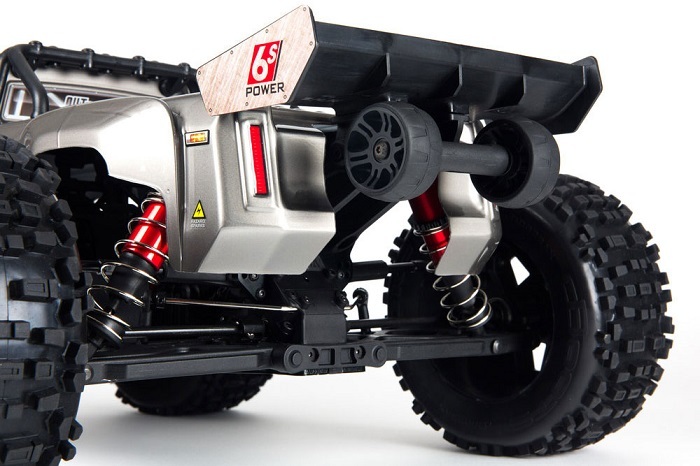 OUTCAST 6S is a dedicated action machine which will make YOU an RC truck stunt hero. OUTCAST 6S boasts a strong composite center body support for added protection when the action gets upside-down. 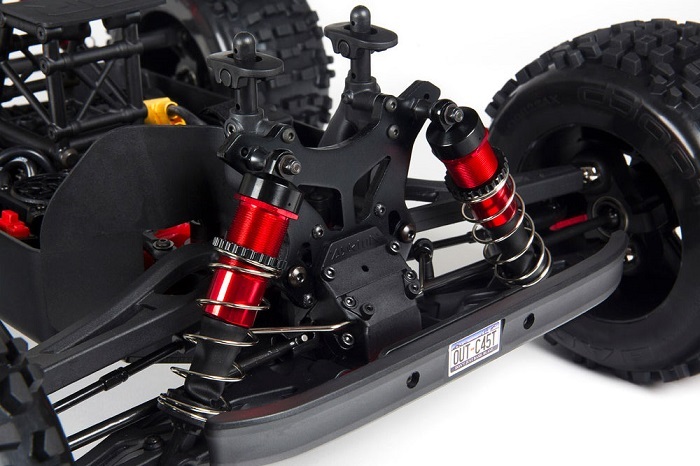 High-wall composite dirt guards at the front of the chassis protect the electronics and the center transmission. 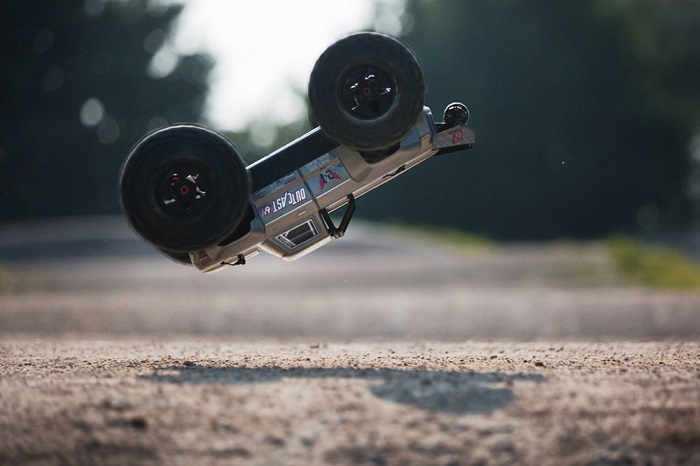 The short wheelbase of the OUTCAST 6S Stunt Truck means it performs wheelies, flips and tricks with ease. A wheelie bar is integrated into the wing mount. It allows long, high angled wheelies. A scale rear wing aids high speed stability and adds to the super-cool looks. 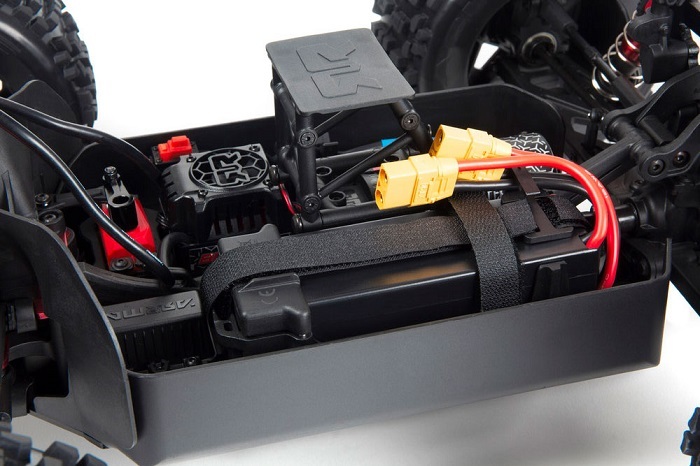 The all-new battery tray in the OUTCAST 6S model holds your batteries in TIGHT. Two hook-and-loop straps, fitted perpendicular to each other, provide a secure fit for your batteries. Secure fitting means batteries can be safely mounted side-by-side or one on top of the other. Wire routing clips fit to the long hook-and-loop strap and keep battery to ESC wires away from rotating parts of the model. The front upper brace of the battery adjusts itself to the height of your battery packs. dBoots 'Back-Flip' multi-surface tyres provide awesome traction allowing you to flip, grip and perform tricks. They are mounted on strong and tough five-spoke wheels. 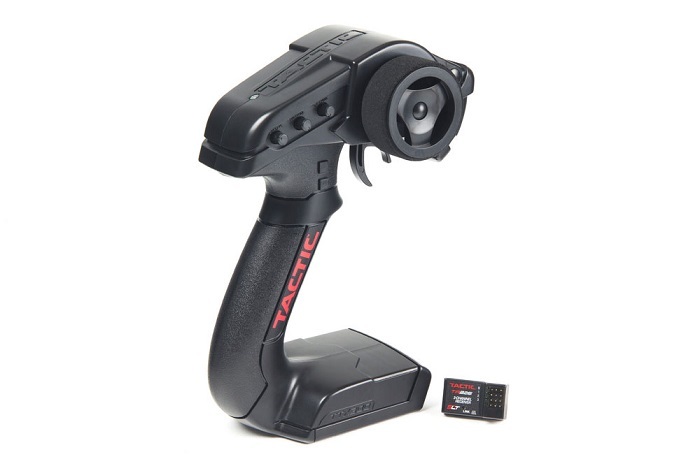 Fully waterproof ESC, steering servo and radio receiver box are standard. This means that hitting the roughest terrains, in the most extreme conditions, will be no problem. Rain, mud, snow, dirt and anything else you want to bash your way through. 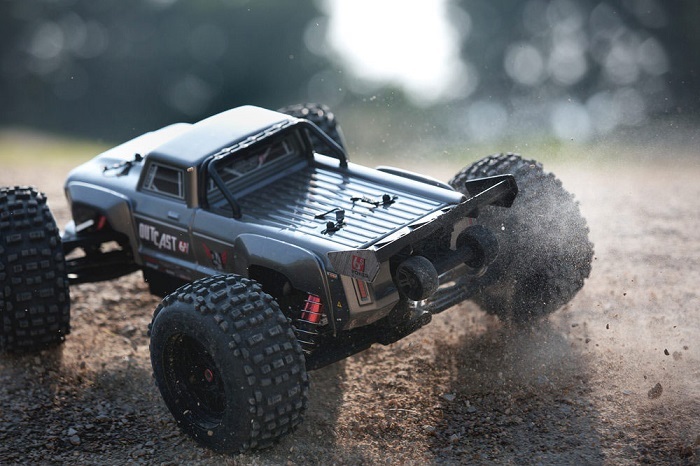 ARRMA waterproof electronics are ready for action. High Angle wheelie bar to enable long, controlled wheelie action. 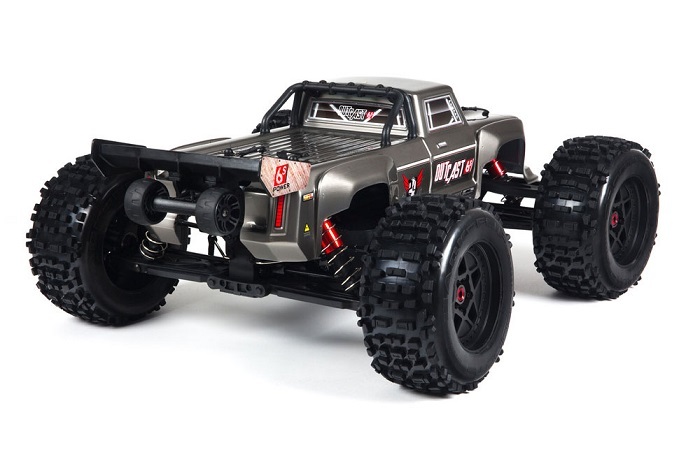 Please Note: This model is sold in RTR (ready-to-run) format but requires 4 x AA batteries, 4S/6S (2x2S/2x3S) LiPo battery with XT-90 Plug & Battery charger.